Broods' "Free" begins with a wail trapped inside a room it detests. Mementos of a decaying love litter the floor; the shelves are filled with torn-up photographs of a fading time. "I'd lose everything so I can sing / Hallelujah, I'm free," Georgia Nott belts, her voice not in tatters but rather eager to tear into something, into someone. Smoke-tailed, bitter, yet resolutely forward-moving, it's a voice of sheer kamikaze recklessness eager to claw into the love that engendered it. No mirror is mentioned, but Nott seems to be staring into one -- a mirror that carries the image of the lover she used to be. Then, a snare hit like a reverse implosion, and this mirror shatters into dissipating sonic shards: Nott hurls herself into a wordless chant of venomous abandon, each burst of vocal energy rising out of her mouth like an insatiable flame. By the time the first proper verse begins, she has reduced her former room -- a place of omnipresent reminders, of hurt and hurtful afterimages -- to ash, clearing space for a new foundation to be built. This is the fire that begins "Free", but it also begins Conscious, Broods' sophomore LP following their 2014 debut Evergreen. Like "Bridges", the breakout hit for the brother and sister duo of Georgia and Caleb Nott, "Free" is a song of high-stakes electropop melodrama. When Georgia claims that she'd "lose everything" to be free, she really means "everything" -- her memories, her well-being, the desires she loved and the loves she desired. This sort of hyperbolic, collapse-of-the-heart sentimentalism drips from the record's lyrics, but it also saturates its sound. Almost every track here, aside from the raw minimalism of "All of Your Glory" and the world-weary R&B of "Bedroom Door", seems to speak entirely through size, volume, and unalloyed synthpop vigor. The 808s don't patter; they punch. The synths, at their peak, don't entice or etch out fog-shapes; they eviscerate, explode into fumes and leaping shrapnel, demanding that Georgia bare her soul to stay above the fray. But she isn't helpless. Equipped with a voice that resembles an amalgam of Lorde, Ellie Goulding, and Chrvches's Lauren Mayberry, she sings with her fists clenched and feet planted, with desperation on her tongue and redemption on her mind. Indeed, throughout the record, she transforms otherwise run-of-the-mill melodies into transfixing passages of vocal power. "We were young / We were proud / We were promising," Georgia sings on "We Had Everything", her words heavy with the weight of the past, and as she tucks into a higher register for the three syllables of "pro-mis-ing", the word itself becomes a broken promise, the promise that once held this past together before falling apart at the seams. Similarly to "Free", it's a track with unabashed top-40 ambitions, but it's also too emotionally involved, too kinetic and melodically memorable to discount as a simple pop confection. "Hold The Line" excels for identical reasons. Bold, beseeching, and replete with one of the record's airiest and most arresting vocals, it's a work of unimpeachable indietronica craftsmanship. Meanwhile, "Are You Home" convulses like a dance-pop confession of late-night desire. Much like Broods, Chvrches shot onto the indie circuit with a few singles carved from icicle synths and fierce, scene-chewing vocals. One of them, "Recover", was a perfect showcase for Mayberry's shatteringly triumphant voice, a voice that still reaches for skies and dives through cloud cover: "And if I recover / Will you be my comfort?," she pleaded, but her recovery was never in question, it was only who - or what - would bring about this recovery that remained obscure. A different story resides in the bloodstream of "Recovery", another highpoint of Conscious and a spiritual sibling of "Recover". Over a pulsating steam-swirl of synthesizers, Georgia begs for the "comfort" that Mayberry once yearned for, but her fate is far less certain: "Meet me on the road to recovery / Recovery / Meet me on the road to recovery," she repeats, and this road seems to simultaneously materialize and disintegrate before her. By the track's conclusion, it's still unclear if she's venturing down this road or just standing at its edge, deciding whether or not the first step is worth the risk. 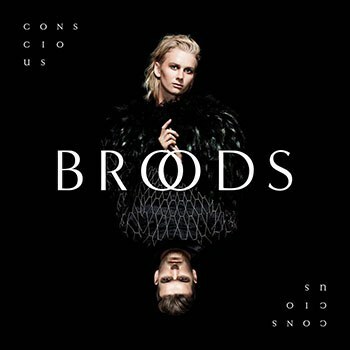 For most of Conscious, Broods' approach to electro-pop maximalism is irrefutably infectious, steeped in convention but none the worse for it. However, at times, the Notts are tripped up by their own formula, relying on bombast and sonic excess rather than authentic songcraft. Both "Worth The Fight" and "Full Blown Love", for instance, don't offer much more than boom-thwack percussion and mindless, soaring synths. Thanks to the steady hand of veteran producer Joel Little, though, Broods have concocted a record of marked consistency, one that commands attention from its first wail to its last syllable.